Finding the best butcher block cutting board for you would take a lot of time especially when there are thousands, even millions with these kinds of kitchen tool. It can be made out of any types of wood with a tight grain structure. But why wood? Why not use the usual plastic or glass cutting board? This is a very interesting question. Although a plastic cutting board is easy to disinfect, it can also hold on to bacteria and can cause contamination. It is best to invest in a quality butcher block cutting board because it lasts longer and is more sanitary than the ones made out of plastic. Buying yourself a butcher block cutting board is now made easier, as this page offers you a comprehensive detail of ten of the best butcher block cutting boards of the year! Butcher block is a style of cutting surface used for heavy duty chopping of meat and poultry. In the past, it is said that Butcher blocks originated in China, they used butcher blocks in the market to easily cut off fresh meat like cows, pig, and chicken. Now, they can be seen anywhere around the world, restaurant kitchens, marketplaces, and at the comfort of your own home! A butcher’s block cutting board goes hand in hand with the best knife in the kitchen. It is used for meat quartering, deboning, chopping, and filleting. A standard cutting board isn’t sturdy enough to withstand the heavy duty cuts, which is why you need to know what type of butcher block you’re getting before you purchase one. In choosing the best cutting board for your kitchen, you must think of the most important aspect of all – durability. It matters mainly because you’ll be cutting off all sorts of animal meat and vegetables on it. If you’re cutting off your usual turkey on Thanksgiving or roasted pig during the holidays and events, your standard cutting board won’t last long. The best block butcher chopping boards come in two different construction methods: Edge grain and End grain. Edge grain: An edge grain’s cutting surface is made from pieces of wood from the edge. It is the square-shaped cutting board that everyone usually envisions. With its thick texture, edge-grained cutting boards are more durable, affordable, and much easier to maintain. It may have its cool perks and advantages, but it can quickly dull knives and are contaminated with bacteria if not taken care of properly. End Grain: The end-grain is made out from end pieces of wood. It is more expensive than the edge grain cutting board, but also known to be more forgiving on knives. End-grain boards have their own fiber that closes back when the knife cuts the board. The type of wood used to create a butcher block can impact the sanitation and ability to keep your kitchen knives in shape. Cutting boards should be made from trees with closed grain, such as birch, maple, or yellow poplar. Regardless of the type of wood used, it is important to ensure it is certified food safe. A board with a smooth, hard surface is what you should look for. You should also ask about the oils and finished used on the cutting board. If you’re looking for the perfect bamboo cutting board, then this one is definitely for you! It can withstand any kind heavy duty kitchen tool! 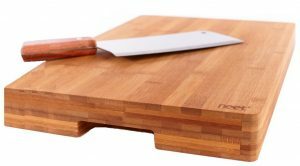 It is crafted from the highest quality of premium Moso bamboo, contributing strength and durability to create the perfect cutting board. It is preconditioned with 100% pure walnut oil spray, so you can conveniently season your board with oil and maintain it anytime you want to. Dubbed as a green chef’s cutting board. 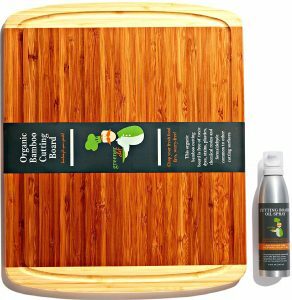 Eco-friendly, FDA-approved Moso bamboo cutting board. Has an additional walnut oil to keep your board from cracking. This beautifully crafted block cutting board is all you need to protect your countertops. Its minimalistic design will go perfectly well with any type of interior you have at home. Although it is not as thick as any other heavy duty cutting boards, it can hold up even to the toughest meat cleaver. It can also be used as a serving tray for cheeses, fruits, and cold cuts to your family and friends! Made with end-grain construction to protect quality knives from becoming dull. Kitchen prep is now made easier with this solid, reversible maple wood cutting board! 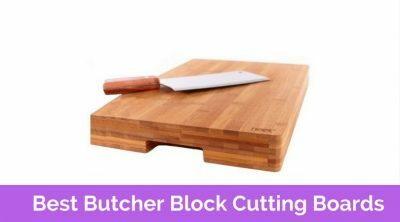 Its hardwood block provides a firm surface to cut your meat, and to protect your countertops or tables from knives and other chopping tools. Easy to maintain with the use of butcher block oil and conditioner. Sold separately. Reversible – can use both sides of the cutting board. Slicing and cutting are made easier with its solid surface. 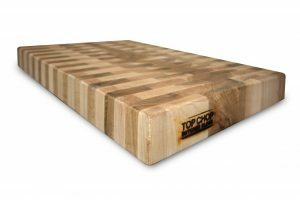 With its beautifully hand-made design, you are sure to love each unique block cutting board from Top Chop Butcher. They create a firm and sturdy board to assist you with your cutting needs. Its thickness is just right to cut vegetables, meat, and poultry without endangering your table or countertop. No need to use your countertops to slice raw food or materials, you have this large and durable cutting board to protect it from knife slices! This cutting board will assist you with your food prep needs! Stylish design made out of bamboo. 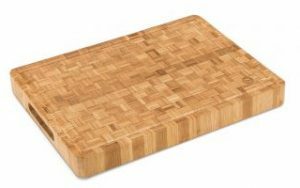 Created from premium bamboo, this end-grain cutting board is designed to resist stains, odors, and warping. It has the perfect surface to cut meats, veggies, fruits, cheeses, and more! Its nonporous bamboo surface resists bacteria, making it a safe cutting board in the very sense of the word. Ultra-tough against moisture and bacteria. Large cutting surface for all types of food prep. Can be used a serving tray or trivet during parties and events. Needs mineral oil to protect the wood from drying out. Not only does it have a stylish design, but it also has a lot of distinctive features that make a simple block exciting to use. It has a sturdy non-slip base, perfect for slicing, dicing, cutting, and chopping! It has a drip groove that prevents juices from spilling over your countertops. 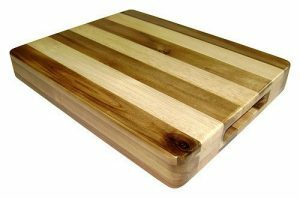 It’s a quality wooden board that will look great on your countertop. Expertly hand-rubbed with natural, food-safe oils. Made from premium furniture grade walnut, cherry, and maple hardwood. Wooden board doesn’t harbor organisms and bacteria. Wooden cutting boards from Jonathan Alden are made from premium grade hardwoods and are treated with food-safe oils right after sanding it smoothly. It is exceptionally strong and durable, solvent- free, water resistant, and FDA-approved for use with food. Friendly on all quality knives – does not create any damage at all. Allows you to cut longer items without hanging them off the board. Made from premium woods making it tough and durable. It has a beautiful design that would definitely go well with your countertops at home. Walnut, Cherry, and Hardwood are combined to create a perfect design that is pleasing to the eyes. Its size and quality are enough for people who likes it simple and usable. 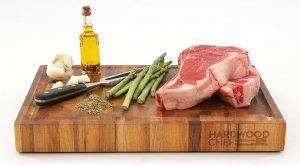 Using a cutting board that is hand-rubbed with natural food-safe oils is guaranteed high-quality. Woodworker’s Classic American Hardwood Butcher Block Cutting Board will last a long time. Easy gripping and lifting with finger grooves on the sides. Protected with a food-safe finish. Measures 15 x 12 x 2 inches, weighs 7.3 lbs. Protect your table and countertops with this butcher block cutting board that is made of maple and blackwood! It has a great size and does not distort over time, making it perfect for daily use around the kitchen. Finger grooves are available on both edges of the block to easily chop, cut, and haul the board. The size of the cutting board is big enough to keep you slicing and cutting for more raw food! Tough and durable – does not break easily. Protects your counter table and tops from unwanted juices and knife marks. Friendly to any of your heavy duty kitchen knives. Board stains could bleed on table and countertop. Not suitable for dishwasher cleaning. If you’re looking for a cutting board that has a fine quality but affordable at the same time, then this is the block that you have been looking for! Be impressed by the two-toned color of the cutting board that would go perfectly with most countertops. It has finger grooves on the side for easy gripping and cutting. Say goodbye to dirty kitchen countertops! This cutting board will answer all your needs in the kitchen, and you can buy it without hurting your wallet! Deep juice grooves to eliminate unwanted juice from spilling over the counter. Can be used as a serving platter for appetizers. Want a cutting board that makes food prep easier? 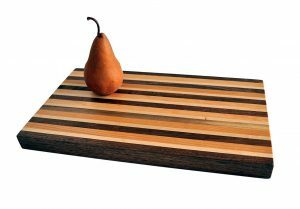 This premium butcher block, which also serves as a serving platter, is made of Acacia wood! It protects your countertops from being damaged from unwanted knife tracks, and prevents juices from running onto your counter. But it doesn’t stop there! You can use it as your serving tray and top it with your favorite appetizers like cheeses and fruits. This gorgeous cutting board is expertly finished with a smooth surface and precondition with mineral oil to enhance its burnished look. Does not do any damage to your cutlery. Does not warp over time when washed or placed with oil. Maintain mineral oil sanitation to keep the wood from drying out. 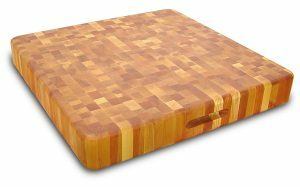 Unlike any other cutting boards, Hardwood Chef Premium Thick Acacia Wood end-grain cutting board does not warp over time. There is no need to worry about extra juices flowing, as it catches excess liquid during food preparation thanks to the juice grooves on the side. This cutting board makes a perfect gift for future chefs or parents at home! Easier handling with the finger grooves on the sides. Reversible – you can use both sides of the cutting board. In need of a bigger cutting board for your kitchen? A board 20 inches wide by 20 inches deep and 3 inches thick is big and spacious enough for huge preparations at home! This cutting board is made of remarkable quality as it is crafted with an end-grain board, making it look neat and impressive. This cutting board does not make your knives dull. Definitely worth the extra money! Both sides of the block cutting board can be used. Perfect for having huge kitchen preparation with its spacious surface. It is much kinder to your knives. Cannot easily haul it to your kitchen sink for washing. Needs regular oil to keep it from splitting, cracking. No juice grooves to collect excess. If you are looking for a board that has a variety of grain patterns for durability, toughness, and beauty, you should choose this product. 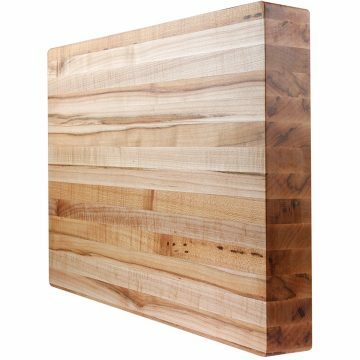 This 24 pound of rugged beauty is definitely the ultimate cutting board for people who knows their way around the kitchen! You will be amazed of how much you can cut with this enormous cutting board. No wonder they called it the Super Slab! This is a wooden butcher block made from brown hard maple. Manufactured with precision and sourced from sustainable forests. Custom-made, so each block is unique to you. Coated with food-safe and FDA-approved mineral oil. If you are looking for a top-quality butcher block, then this product has what it takes to meet your needs. It is made from brown hard maple, which makes it highly reliable in the kitchen. It can withstand average to tough cutting, slicing, and dicing. It is friendly to your knives; it won’t dull them easily. Plus, it has the rustic and homey look that makes it a great tool to have on your kitchen countertop. This butcher block is made in the highest of standards, from cutting and planing it to sanding and oiling. It is sourced in a sustainable manner and since it is custom-made, you can be sure to have a one-of-a-kind block. Not only is it a great and dependable kitchen tool, it has a simply and rustic esthetic that is pleasing to behold. It is thick and solid, and will last the test of time. Out of the box, the board’s surface is sometimes not flat. But this can easily be fixed with sanding. Butcher blocks are designed for reliability and durability. The Kobi Blocks Maple Edge Grain Butcher Block certainly meets these criteria. It is a high-quality product that will last long and will help you through even the most involved food preparation process. And it looks great on the countertop! Reversible and solid maple wood cutting board with natural oil finish. Guarantees a clean cutting board as it does not gather bacteria. With this maple wood reversible cutting board, food prep will be a breeze. The material used comes from select individual trees harvested and grown naturally. Every cutting board from John Boss is finished with food safe beeswax to maintain its structure and design. It has a sleek profile and is lightweight. Made from maple wood edge-grain construction. Reversible – can use both sides of the block. No juice grooves available to keep excess from flowing out. The thin structure of this maple wood reversible cutting board is ideal for easy storing and usage. Both sides of the board can be used for chopping, slicing, and cutting. Aside from slicing for your food prep, you also get to use it as a serving tray during parties to hold your favorite snacks and appetizers! This 8.5 Pounds of 100% solid natural organic bamboo is gentle on your knives. Cut anything from vegetables, meat, and poultry! This 8.5-pound organic bamboo butcher block will endure all butchering knife that hits its surface. Bamboo blocks are naturally durable than most regular woods and are bacteria resistant. It is FSC/FDA-approved, antimicrobial, and lacquer free, ensuring safety and reliability when used. 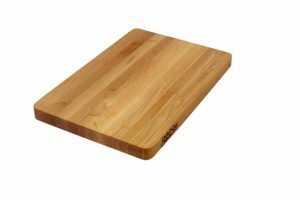 This board is crafted from 100% solid and natural organic bamboo that guarantee you a lifetime of high-quality cutting board! Ensures lifetime quality with its natural and organic bamboo. Stronger and durable than regular wood. Can be used as a serving platter. Aside from the fact that it is FSC/FDA approved, Antimicrobial, and Lacquer-free, this block cutting board is strong and has a smooth surface making it easy to use without getting warped. The handles on the side of the board make it easier for you to move around your kitchen with the board in tow. Its 16.5″ Length 12″ Width 2″ measurement provides more room for extra cutting!